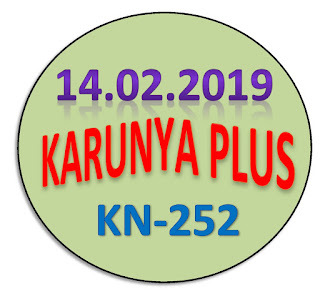 Kerala lottery guessing / predictions for KARUNYA PLUS KN-252 dated 14.02.2019 is published below.These guessing number are just our and our visitors predictions. This is only a speculative game for fun and to increase the curiosity on the draw. 2/13/2019 20:55:58 KT T.Gode. AB&BC&AC:86.68.82.28.62.26. 2/14/2019 13:53:01 கேசவன் கடலூர் 376.274.271.270.383.384.265.918. ALL BOARD:: 5 - 2 - 3 - 9. A = 5 - 2. B = 3 - 5. C = 5 - 9. 237, 236, 233, 437, 436, 433, 737, 736, 733. 653, 654, 657, 658, 153, 154, 157, 158.